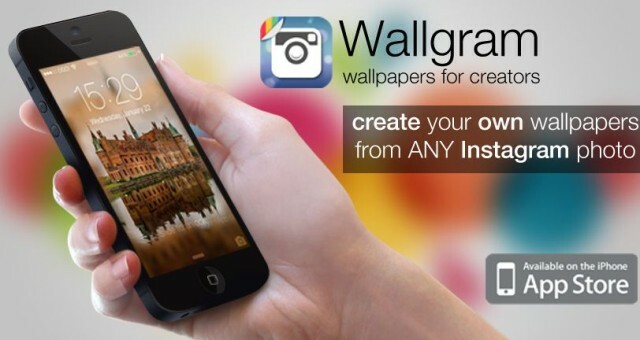 Wallgram Turns Instagram Photos Into iPhone Wallpapers. If you’re anything like me, you’ll change your iPhone’s wallpaper on a regular basis to keep things fresh, but finding a good one isn’t always easy. At least that was the case — until Wallgram came along. Wallgram isn’t just another photo bank full of images; it uses Instagram photos uploaded by your friends to create beautiful parallax wallpapers. The great thing about Wallgram is that its catalog of images is as good as infinite. Not only can you use photos uploaded by you or your friends, but you can also use the “explore” tab to search for people and hashtags. So if you want a photo of Times Square in New York City, or even a cat painted in latte foam, you can find one — and it won’t be the same photo you might’ve found on Google Images. And with over 50 million photos uploaded to Instagram every day, you’ll never be stuck for a new wallpaper. Of course, Instagram photos aren’t big enough to use an iPhone wallpapers without a bit of tweaking, so Wallgram has a nifty way of making them look good on a high-resolution Retina display. Not all images look great, but it’s certainly not difficult to find one that does. Wallgram is available to download from the App Store now, priced at $1.99. You’ll need an Instagram account to use it. 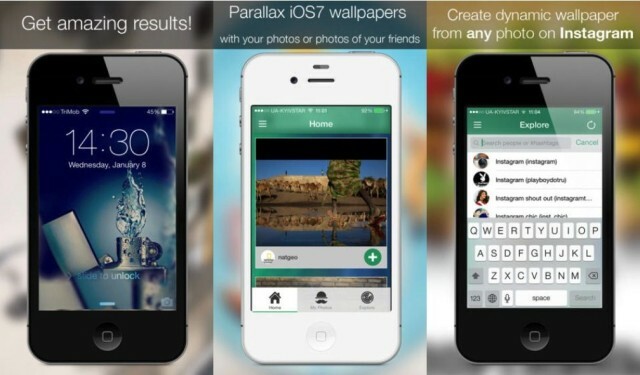 Wallgram: Convert Instagram shots into iOS 7 parallax wallpaper. Are you at a loss for wallpapers to decorate your lock and home screens? Wallgram (US$1.99) is a new app that resolves that problem by letting you convert any Instagram photo — your own included — into attractive and functional iOS 7 parallax wallpaper. The app, from developer Capable Bits, is rather simple, but does a really good job of preparing those photos for life as wallpaper. After launching Wallgram, you’re greeted with a simple UI and asked to let Wallgram have access to your Instagram account. Once that’s done, a “Home” button displays the timeline of Instagram photos from those people you follow; a “My Photos” button does the same for your Instagram images; and you can also tap an “Explore” button to view a feed of popular Instagrams. Regardless of how you discover the picture you want to turn into wallpaper, you just tap a large green button emblazoned with a white plus sign and the image is “awesomized” and added to your camera roll. What does “awesomization” entail? Basically, it takes the outer fringes of the photo and blurs them while keeping the center of the image quite sharp. At this point, you can just go to your cameral roll, tap on the image, tap the share button and select Use as Wallpaper. Just move the image so that it looks the best to you — in most cases, this will be with the sharp portion of the image in the center of your iPhone screen and the top and bottom blurred — and tap the Set button to save the image as your home screen, your lock screen or both. If there’s one complaint I have about the “awesomization” process, it’s that I wish that the blur was adjustable. The transition between blurred and non-blurred photo seems a bit abrupt, and I’d like to see the ability to adjust that transition as well as what parts of the image are blurred or not. But for the most part, Wallgram does exactly what it’s supposed to do — let you convert Instagram photos to iOS 7 parallax-view iPhone wallpaper in as few steps as possible. When you consider that you have an almost endless supply of wallpaper images to choose from each day from Instagram, that $1.99 price tag seems like a heck of a deal. Those wallpapers can theoretically be shared via Twitter, Facebook and email — I say “theoretically” because the sharing features were not working in the version I downloaded for review. Wallgram requires iOS 7, and is optimized for iPhone 5. 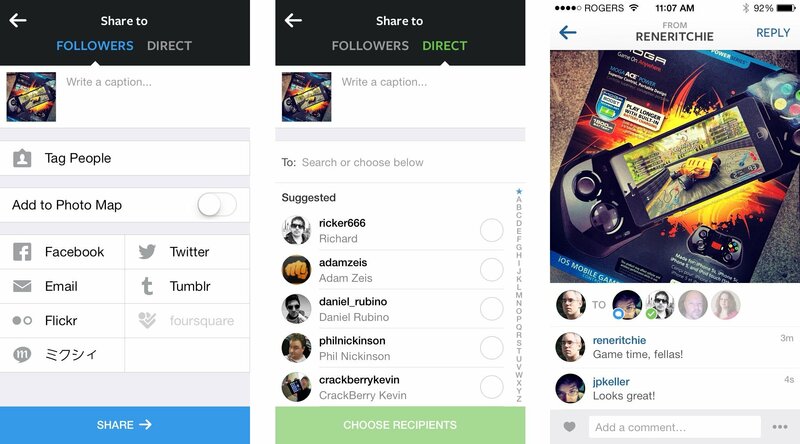 Instagram Direct now lets you send private and group messages. Instagram has updated their app to 5.0, bringing their new Instagram Direct messaging feature. 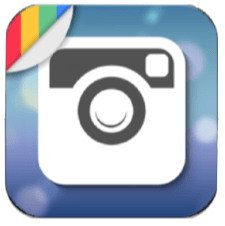 With Instagram Direct, you can send messages, pictures, and videos to other people privately. Between one and fifteen people can participate in a conversation, and all conversations must begin with a photo or video. To use Direct, select the Direct tab while in the sharing screen or open Instagram and tap the new icon in the upper right corner. On the sharing screen, you will now notice that you can choose to share your picture or video with followers, or using Direct. When you choose Direct, you can add a caption, select the recipients of your message, then hit the big green Send button at the bottom of the screen. People can then comment on your picture or video, or send their own in reply. If you’re not following someone and they try to send you a Direct, you’ll get a request so you can choose if you want to see it or not. The Instagram 5.0 update is available now from the App Store. We’ve been testing it this morning and it seems to work well. You can clearly see who’s viewed a Direct, and who’s commented on it. How it scales over time, and how Instagram manages that scaling will be interesting to see. Once you’ve tried it out, let me know what you think! Instagram to run ads starting next year. You knew it was too good to be true. Instagram has been free to download and use since it first hit the App Store in October of 2010, but now the app will be turning into a conduit for ads in order to turn a profit and make Facebook’s billion-dollar acquisition look like a smart deal. Instagram’s director of business operations, Emily White, outed the news about Instagram ads in a Wall Street Journal article yesterday. White told the WSJ that Instagram should be ready to start selling ads next year. Meanwhile, the company with the mission of capturing and sharing the world’s moments needs to determine a way to make those ads visible to its 150 million-plus users without risking a mass exodus. Last December, a change in Instagram’s terms of service carried the implication that user content — your photos and short videos — could be transformed into ads, and many users pushed back by dropping the service. However, a gain of 128 million monthly active users since Facebook bought the company has more than outweighed the few who left in a huff. The challenge to Instagram is to make the service valuable to advertisers without making users — who are used to an ad-free Instagram — irate. Whether or not that challenge is met by the company remains to be seen. Instagram physical camera goes from concept to reality thanks to Polaroid and Socialmatic. ADR Studio came up with a physical concept named Socialmatic a little while back. Essentially, it’s a camera that looks like the Instagram logo and has an inbuilt printer to instantly print your filter-covered images. Although there are online services that offer printed photos, stickers and magnets for Instagram, this option is certainly enticing. The company behind the concept has just announced a deal with Polaroid to make the camera a reality. The Polaroid Socialmatic camera will be available in the first quarter of 2014. There aren’t many details on specification right now, but they will be released as the product gets developed further. Although this is almost certainly an interesting gimmick and collection piece, I’m pretty stoked and would love to get my hands on one. Instagram hits 100 million users. News today, via Instagram’s latest blog post shows that the photo sharing app now has 100 million monthly active users. The achievement marks the culmination of 2 and a half years of development, and a takeover by Facebook. Despite several controversial decisions in the last year, such as the content licensing scandal and its ongoing scuffles with Twitter, Instagram is now stronger than ever. What makes this achievement even more astonishing is that just one month ago Instagram announced that it had 90 million active monthly users, which means that 10 million new users have joined in the last month, absolutely tremendous growth. According to data, users upload 40 million new photos every day, and Instagram clocks 8,500 likes and 1000 comments per second. To read the full post, click here. A heartfelt congratulations to Instagram upon reaching such a monumental milestone from all of us here. Instagram finally brings full picture feed to desktop site, but still can’t upload. The Facebook owned picture sharing service that lets you filter photos and convinces teenage girls that they are a professional photographer, better known as Instagram, has finally brought the full picture feed to the desktop, in the form of a reworked website. That’s right, simply by visiting and logging in to www.instagram.com will reveal to you the picture feed that you would see by logging on to any mobile device. You can do everything from like pictures, to comment on pictures, to…hold on, you thought I was going to say upload pictures, didn’t you. No, sadly you still can not upload pictures directly to the site. Other than that, it is a very welcome update to the site.